Kauai vs Oahu : Which Island for Your Epic Vacation? For those of you who don’t like reading, let me blurt this out. If your interest is nightlife, shopping or surfing, Oahu is your choice. If you want to avoid the crowds and maybe find your own private beach, Kauai is your best option. When deciding which Hawaiian island to visit, the question of whether to go to Kauai or Oahu surprises me the greatest — mostly because the two islands are so different. I think choosing between Maui and Kauai is a much tougher decision. But lets take a look at both islands to sort it out for you. The cost of living on each island is quite similar but where you may notice a difference is in the cost of airfare. In the old days, when you flew to Hawaii, you first flew to Honolulu and then hopped on a smaller plane to pop over to one of the other islands. Those days are gone and it is much easier to fly directly into Lihue on Kauai, Kahului on Maui or to either of the airports on the Big Island (Hilo or Kona). The earlier cost of two separate flights was always more expensive than a single trip to Honolulu. Today, it is still more expensive for me to fly to Kauai than Oahu but not by much. It is only about a $70 difference and is probably accounted for in the extra miles to get farther west. Depending on how many days you will be spending in Hawaii, lodging will be your second biggest expense. All things being equal, lodging in Oahu is usually cheaper for similar class hotels. You can do a quick expedia or travelocity search to prove that out. 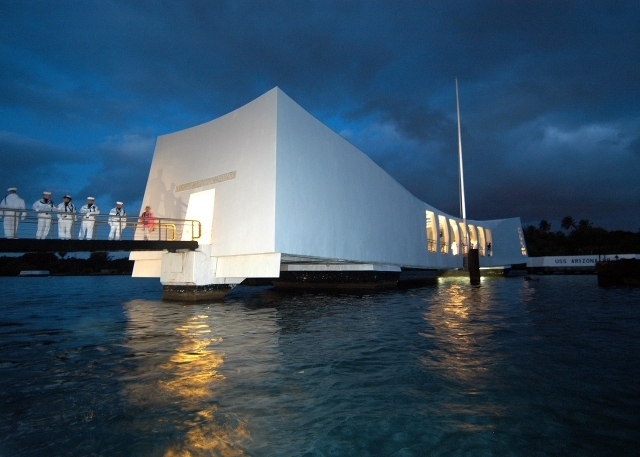 Without a doubt, my favorite attraction on Oahu is the Pearl Harbor memorial. It is a very popular place and with reason. I feel everyone should visit the USS Arizona Memorial at least once in their life. I’m not the only one that feels that way and it is an extremely popular destination. If you go there, visit as early as possible (it opens at 7 a.m.). After the tour buses arrive, the lines can get long. 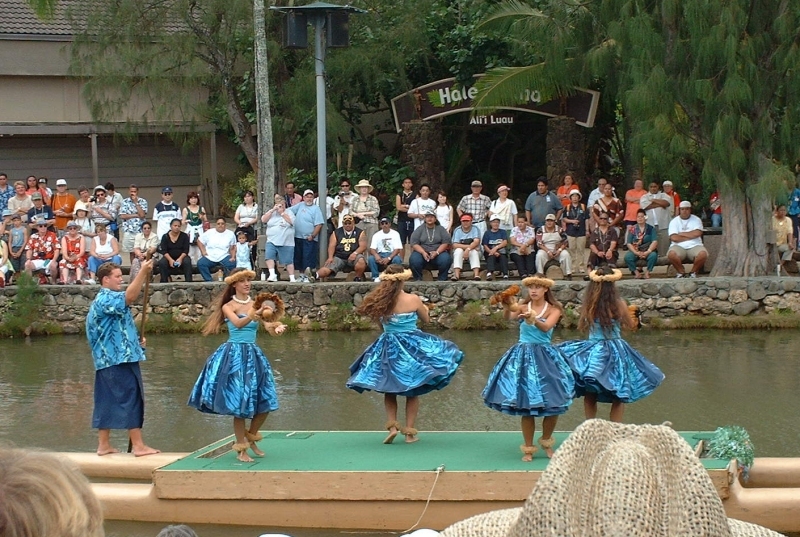 Another very popular attraction on Oahu is the Polynesian Cultural Center. The PCC educates visitors on six different Polynesian cultures: Tonga, Tahiti, Hawaii, Fiji, Aotearoa, and Samoa. You can wander around the 42 acres and engage in a number of hands on experiences including spear throwing, hula dancing and playing the drums. Probably the coolest attraction on Oahu is the Haiku stairs but it is no longer open to the public. It was closed off a few years ago for safety and parking problems. But you can still see pictures of the Haiku stairs and see what you are missing. From the pictures, it is easy to see why that hike is often called the stairway to heaven. For you more adventurous, the top surfing spots in Hawaii are in Oahu: Laniakea, Backyards, Sunset, Velzyland, Canoes and Ehukai Beach Park. While surfing is available for beginners on Kauai, Oahu is your destination if you are an advanced surfer. Kauai is often called the garden isle. 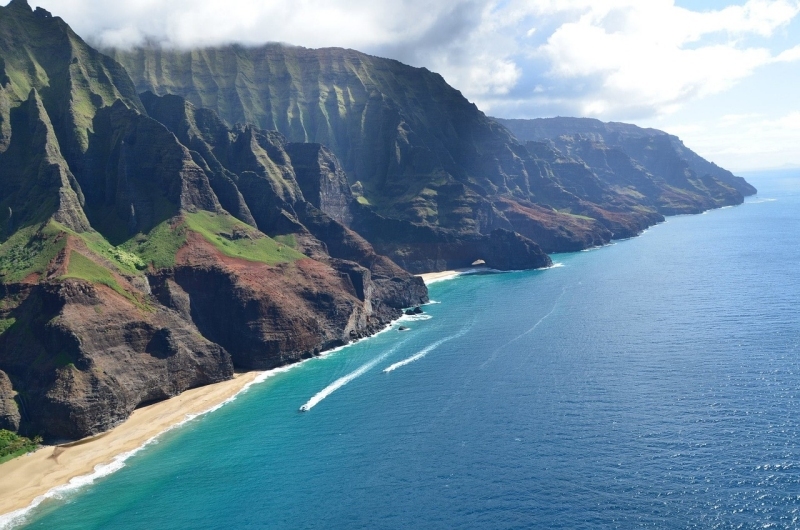 The greatest attraction on Kauai is the NaPali coast. It is an amazing site and showcased in many movies. The NaPali coast is probably my favorite attraction in all of Hawaii. It is just so awesome. One thing to keep in mind if you plan to go to Kauai to visit the this famous coastline is that it is best viewed from a distance. You can hike along the NaPali coast but the real beauty is to get the entire view from a little ways off. Typically, this means viewing it during a boat tour or helicopter ride. If you can’t afford either of those, your best bet it to look down on it from Kalalau lookout from the top of Waimea canyon. Another option for the adventurous, is to kayak along the Napali coast. This option is only available during the summer months from May to September. Another unique geographical feature of Kauai is its Waimea canyon located at the center of the island. Once called “the grand canyon of the Pacific”, it is a great place to hike and see waterfalls. Up North, you can visit lush green Princeville and golf. 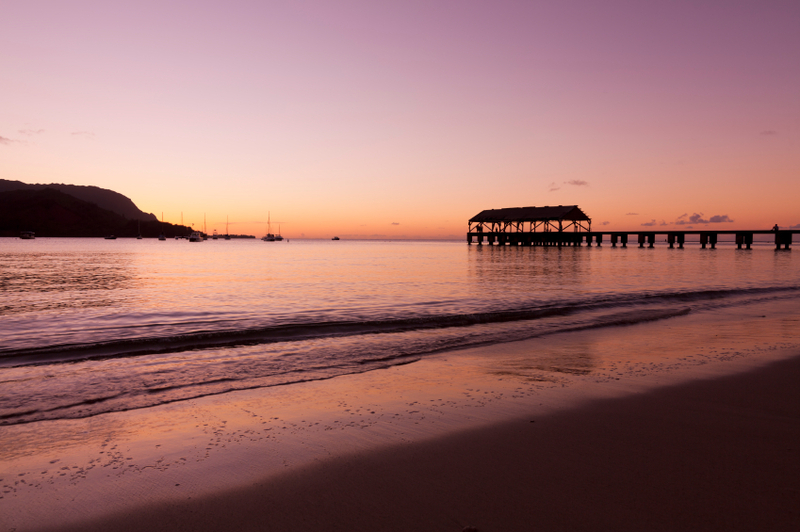 For the romantic, visit Hanalei bay and catch a colorful sunset. Both islands have plenty of nice beaches. Oahu is the home of the world famous Waikiki beach. Here is a sampling of some of the more popular beaches on Oahu. As you can see, they are scattered pretty uniformly around the island. Where ever you stay, you shouldn’t be too far from a beach. Depending on your source, Oahu has between 125 and 139 different beaches. So I won’t be covering them all here ;). Kane’ohe bay is the largest protected body of water in Hawaii. It is eight miles long and 2.7 miles across and is dominated by reef. At the North end of the bay is Mokolii. 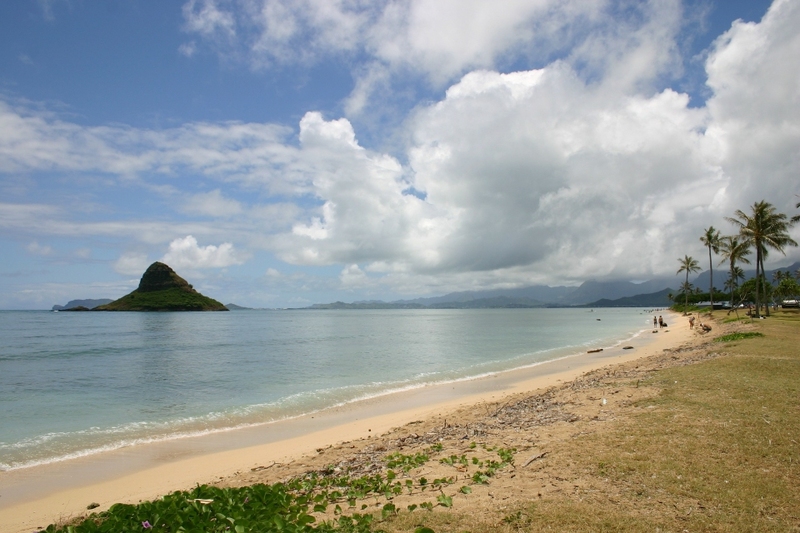 This iconic island juts out of the water and is aptly named Chinaman’s hat. This is a popular destination of kayakers and stand up paddlers. Kane’ohe bay is a nursery for hammerhead shark so you may see a school swimming by. They are easily spooked by humans and serve as no threat. Kailua beach, at 3 miles long, is considered by some to be Hawaii’s best beach. It is a nice white sand beach nestled in a residential area. From this beach, you can kayak out to a couple of small islands (Mokulua). It is very popular for swimming and sailing and can be very busy and very crowded in and out of the water. Lanikai Beach was ranked as the world’s No. 1 beach by Conde Nast in 1996. The translation for the name is “heavenly ocean” and is a favorite destination of many. It is great for swimming but not good for snorkeling. There are no bathroom facilities. To rinse off, you may need to pop over to Kailua beach for their showers. Waimanolo beach is almost six miles long and a favorite among locals. Because of that, it is best to visit during the week as it can become quite crowded on weekends. The waters here are a little rougher than other beaches mentioned here. Sandy beach is another rough water destination and is a favorite for body surfers. Unless you are a daredevil, it is best to come watch. This beach is smaller than the others at only 1,200 feet long. This beach is claimed to be a favorite of President Obama. Hanauma bay is well protected and a very popular spot for snorkelers. It opens at 6 am and that is when you should arrive if you plan to go there. Parking fills up quickly. Wai’alea beach is smaller and not as busy as the others but also not as nice. Some like to go there for seclusion and a nice sunset. It has a limited sized parking lot. 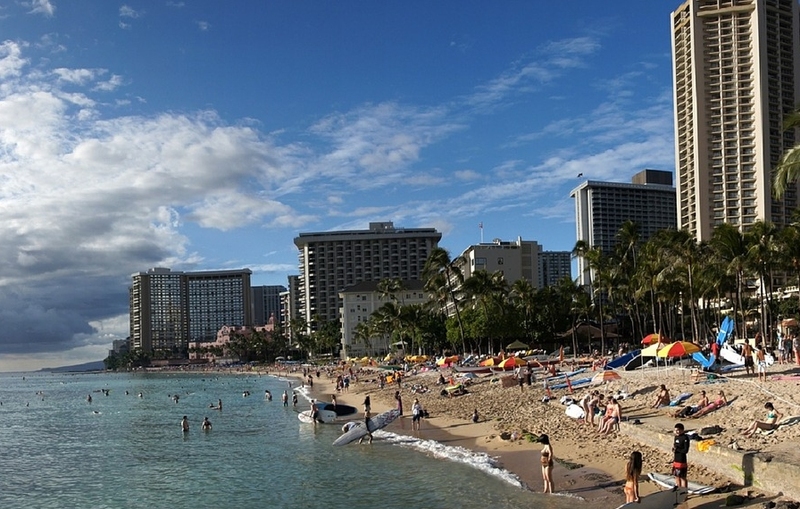 What can be said about Waikiki beach that you don’t already know? It is probably the most famous beach in Hawaii and is know for its views of Diamondhead (a famous volcano cone) and rows of skyscrapers on its beach. It was also the filming location for many TV shows and movies. It is loved by many but I find it a bit claustrophobic. Ala Moana beach is a half mile beach located between Waikiki beach and Honolulu. It is protected by an outer reef but the shore drops off quickly so it is not for beginning swimmers. This place is frequented by the homeless and is a rough place to be after dark. Ko Olina a resort area dominated by four different vacation clubs and resorts. It consists of three natural and four man-made lagoons. It boasts of two miles of white sand coastline. Makua beach is one of the more secluded beaches as it is the second to last stop on highway 93. It is a beautiful beach but the waves can be rough so swimmers should stick close to shore. Recently, this beach has been closed to over night camping. Yokohama beach is the last beach on highway 93. During the summer months it is a great place for swimming and snorkeling. Also, since it is located at the end of the road, it is a less crowed beach. No tour buses here. People don’t pop in here on there way to somewhere else. Malaekahana bay is a beautiful white sand beach with rough waters and no lifeguard. It is a popular location for boogie boarders and surfers. A small island known as goat island is a short swim away and home to sea turtles. Kokololio beach is a nice beach to swim at during the summer months but a little more intense during the winter. During winter, you can surf and boogie board. This is a great place for pictures when the surf is pounding. The name Kokololio means swift wind gusts. That fact might be worth filing away in your memory banks. If this isn’t enough Oahu beach information, you can check out this guide to Oahu beaches. Kauai also has plenty of great beaches. Here is a run down of some of the more popular ones. For a more detailed report on my favorite Kauai beaches see my post on best Kauai beaches. 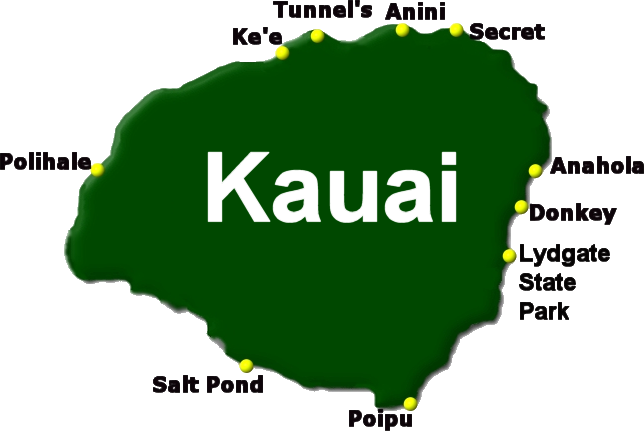 While I talk of some of these beaches being popular, those are in terms of the Kauai beaches. None of the Kauai beaches come close to the crowds you will find on Oahu. Ke’e beach is awesome if for nothing more than the amazing assortment of sea life you will find snorkeling. Located at the north end of the NaPali coast and at the trailhead for the Kalalau trail, this is a popular beach with limited parking. If the day is hot, there are plenty of shade trees to seek protection. Tunnels beach is another awesome beach but has even more parking woes as there is no official parking lot for this beach. There is plenty of reef here for great snorkeling. Because of the extensive reef, it is not a good beach for swimming or boogie boarding. There are no public restrooms here but you can find them nearby at Haena beach park (to the west). Anini beach is another long beach protected by an extensive coral reef. Its a great beach for swimming and fishing. There is public parking and restrooms. Secret beach is not a real secret but a little tough to locate. The real name is Kauapea beach. It is very scenic, great for pictures and popular for surfing and boogie boarding. Here are the directions to secret beach from the city of Kilauea. The dotted line represents a 20-30 minute hike down to the beach. That alone gives you an idea of how many people you will see there. Anahola beach park is a favorite among locals and is great for swimming. Camping is allowed here with a permit. Donkey beach is an uncrowded beach popular with the surfers. It can be rough for swimming at times. Lydgate state park is a great place for the beginning snorkeler. It has two areas surrounded by a man-made wall of lava rock. One is called the keiki pool (keiki means kids). The other area is for snorkeling. It is well protected and is surprising how big of fish you will find swimming in there. This is also a great beach for sunbathing and people watching. It is close to Wailua and Kapaa. There are great facilities there and a great playground for the kids. Poipu beach is one of the most popular beaches on Kauai with both tourists and locals. It is protected by a large reef which makes it popular for families with young kids and with those who like to snorkel. I have seen many beached seals at this beach. Salt Pond beach is great for swimming and is popular with families with young kids. From the name you can guess that salt might be harvested here and you would be correct. Salt Pond beach can be windy in the afternoons. Polihale beach may very well be my favorite beach in all of Hawaii. Found at the end of a dirt road at the end of highway 50, few people venture out that far. But for those who do, they get their own private beach. Polihale is seven miles long so it doesn’t take the skills of Ferdinand Magellan to find a section for yourself. Be forewarned, this is more a beach for lounging than swimming. The drop off is steep and the waves can be rough but if you find yourself on Polihale at sundown, you will be treated to the sweetest most peaceful tropical sunset ever. There are plenty of hikes on both islands for a variety of endurance levels. The good news for those who want a light hike, you can find about any beach and walk as far as you want and see plenty. The three most popular hikes on Oahu are pretty easy. The most popular is the hike to the top of Diamondhead crater. It is a steep 1.6 miles round trip and the views of Oahu from the top are stunning. It can be a hot hike so you may want to tackle it before 8 in the morning or after 5 in the afternoon. Another popular hike on Oahu is the Manoa Falls trail. It is 1.5 miles round trip and shaded as you walk. 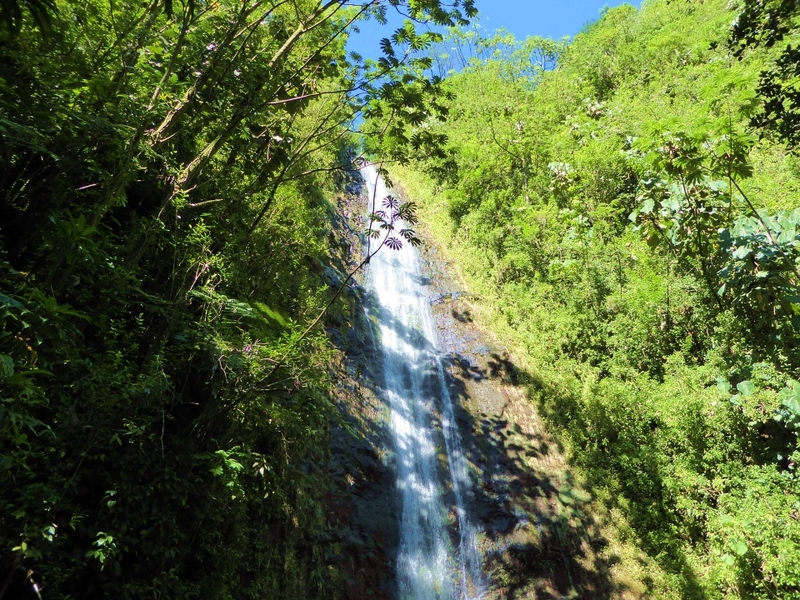 You hike through rainforest and pop out at a classic Hawaiian waterfall. This is a great hike for families. The final hike I will mention is also 1.5 miles round trip ending with stunning views. It is the Makapu’u lighthouse trail and has plenty of World War II history (lookout points, pill boxes, and a plane wreckage). If you hike it during the Humpback migration (February – March), you might even sight a whale from the lookout point. An easy, very scenic hike along the south shore of Kauai is the Mahaulepu Heritage Trail and is four miles one way. The trail starts at Shipwrecks Beach on the Ke-one-loa Bay and takes you to Mahaulepu Beach near the Kawai-loa Bay. It is a walk along the shore and you will possibly see some sea turtles or other wildlife. Catch a better idea of this hike at the Mahaulepu Heritage trail virtual tour. On the west side of Kauai, Waimea canyon provides a great number of hikes with great views both of the canyon and the ocean and some even take you to iconic Hawaiian waterfalls. There are two great hikes hikes you can take in Waimea canyon that I would like to mention. The first is the Nu’alolo cliff trail which allows you to look out over the Napali coast (Nu’alolo valley specifically). On clear days, the views are dramatic. This is a strenuous hike that will take all day but one you will remember forever. The second hike is the Alaka’i swap trail. It is the highest swamp in the world but you will be walking on a wooden boardwalk. This hike also has great views and boasts of rare plants and birds. 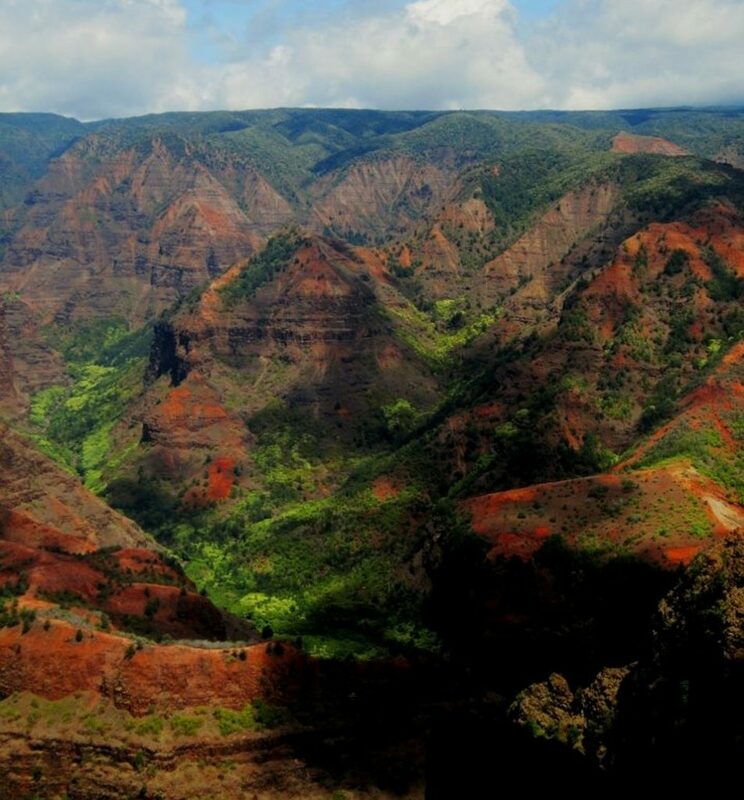 You can get a map for both of these hikes at the ranger station at the top of Waimea canyon. The final hike worth mentioning is the grand-daddy of all hikes in Hawaii, the Kalalau trail. At one time, this hike topped National Geographic’s adventure list. I’m not sure where it stands on that list these days but I do know many sources list it as the most dangerous hike in the world. There are probably more perilous hikes but this one probably claims the most lives. To get an idea of the peril, check out this video of crawler’s ledge. If that looks like your thing, go for it. For the rest of you, all is not lost. You can still take in the first portion of this trail and catch much of Kauai’s beauty. In fact, at a couple of miles in, you can take a two mile detour to Hanakapi’ai falls. It is a lush but still challenging hike, especially if wet, but you are rewarded to a 300 foot waterfall. This makes for a great day hike. The full Kalalau trail is 22 miles round trip and requires multiple days. If you have a strong interest in hiking, you should checkout the official Hawaii hiking website. It has extensive lists and details of hikes on all the Hawaiian island. The people density is computed by taking the population, adding in the number of daily visitors and dividing by the size of the island (square miles). The result is the number of people per square mile. 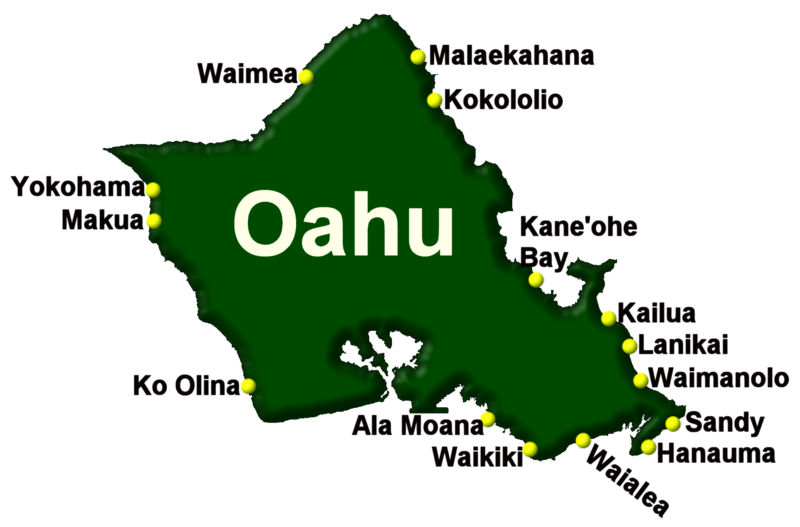 Despite the appearance of the maps above, Oahu is slightly bigger than Kauai (by 45 square miles) but has ten times as many people per square mile. This is apparent by the appearance of the beaches and the amount of traffic that your drive through to get to those beaches. On a side note, if you want to do your own visitor population analysis, check out this tourism report by the state of Hawaii. Its a quick 187 page read and very impressive. If you are an unemployed statistician, you should look to the Hawaii state government for a job. I have never seen data sliced and diced and viewed in so many different ways. Honolulu is populated with lots of skyscrapers to house all its visitors. Kauai has a law that no building can be taller than the tallest coconut tree. This is the difference between the islands in both appearance and attitude. Oahu is known for its bustling nightlife while Kauai is known for its lack of it. That alone may be the deciding factor for you. 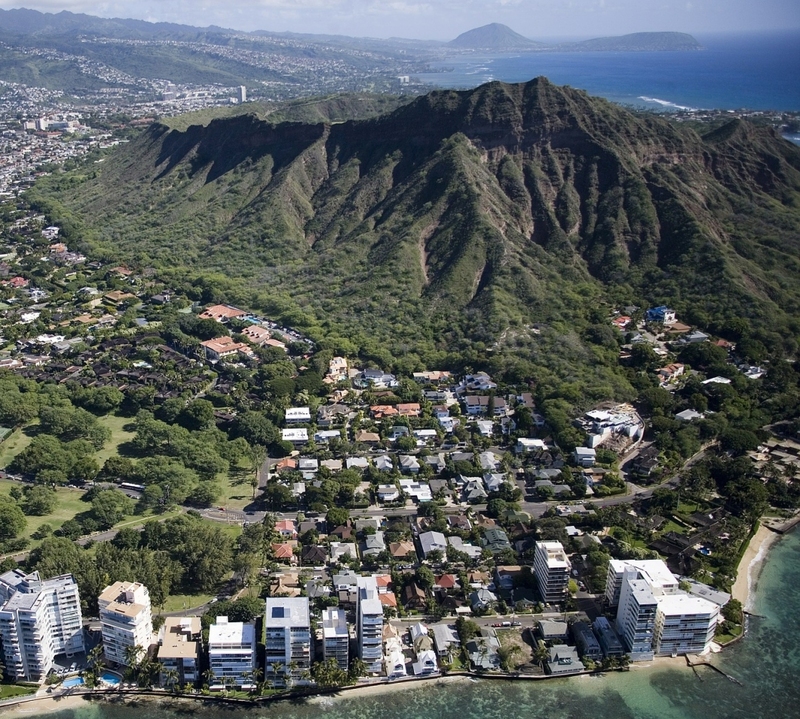 Oahu gets the nod for nightlife, surfing and shopping. Kauai has the advantage for more peace, a secluded romantic getaway or just plain avoiding the crowds and traffic. Here is one final note on the differences between the islands. If you want to visit Hawaii but don’t want to rent a car, Oahu would be your only option. The public transportation system in Oahu is very good and you would be able to get around to many places. I cannot say the same for Kauai. While they have a good bus system, it just won’t get you to where you would want to go. You would need to rent a car. You need to rent a car on the other Hawaiian islands too. If after looking at the features of both islands, you still cannot decide, I will give you the same advice I give to those torn between Maui and Kauai. Just pick one and go. You won’t go wrong. They are both awesome islands and you will have a great time on the one you choose. Then on your next vacation, visit the other island. Again, you will have a wonderful time there too.